A new film titled Red Shoes and the 7 Dwarfs from South Korean animation company Locus Creative Studios was slated to come to the United States, with a voice performance by actress Chloe Grace Moretz. 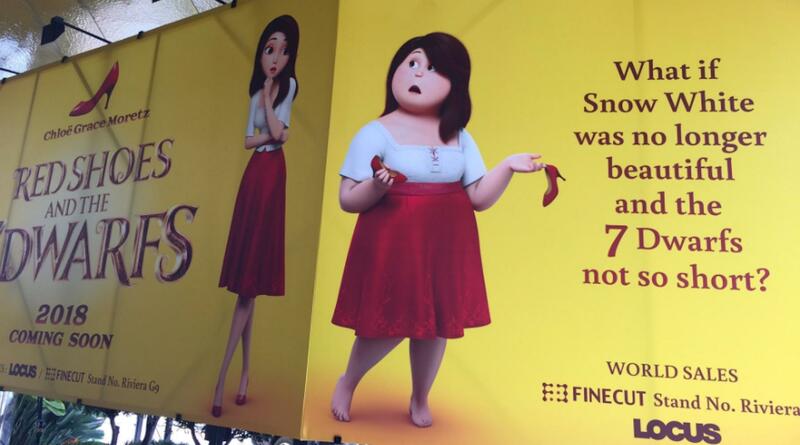 But ads for the film that recently appeared in Cannes are infuriating people, as they seem to equate beauty with being thin and tall. On the company's website, the story is slated as a moral tale, explaining that the "seven handsome princes" were transformed into "seven ugly dwarfs" because a curse is punishing them for being "disrespectful" to other people. Their quest? To get a kiss from the most beautiful princess in the land! The "twist" is that the woman considered the most beautiful in the land gets shorter and heavier when she removes her red shoes. And judging from some of the trailers, that's not the only weird thing about it. Tess Holliday wasn't the only person who noticed the ads that read, "What if Snow White was no longer beautiful and the 7 dwarfs not so short?" What if, indeed. What if Belle were ugly and the Beast wasn't a beast? What if Sleeping Beauty was awake? These are the questions that keep me up at night. I guess if you really want to know, you have to go see it. But beware: you may just be giving money to something that's as bad as it looks.